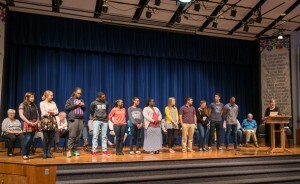 A variety of student accomplishments were celebrated at Eastern Mennonite University’s annual spring student recognition chapel service today [April 15, 2016]. Nathan Peters accepts the Jay B. Landis Award for Excellence in Literary Studies from Professor Michael Medley, chair of the Language and Literature Department. 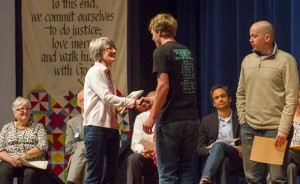 Nathan Peters was awarded the Jay B. Landis Award for Excellence in Literary Studies. Naomi Scoville was given the Omar Eby Writing Award and the James R. Bomberger Award for Excellence in TESOL. English education major Rebekah Hertzler earned the Carroll Yoder Award for Teaching Excellence. Kari King, who was the student representative on the faculty search committee, earned The Ray Elvin Horst Award for Excellence in Spanish. Teachers of Promise Institute participants are Austin Mumaw, Erin Nafziger, Isaac Driver, Malea Gascho and Ruthie Beck. The “Courage to Teach” Award was presented to Angelica Diaz. The Exemplary Achievement in Psychology: Service and Scholarship was awarded to senior Brooke Lacock, co-president of the Psychology Club. The Exemplary Achievement in Psychology: Service and Scholarship was awarded to senior Brooke Lacock, co-president of the Psychology Club, for her impact on the psychology department and the campus as a whole, said Professor Gregory Koop. Mackenzie Lapp and Rachel Bowman earned the G.R. Lehman Outstanding Achievement in Research award for their “exceptional dedication” to their senior research projects. Koop praised their “intellectual curiousity and dogged persistence” and predicted future graduate school success. All three students are among nine psychology majors presenting research at the Virginia Association for Psychological Science annual conference April 20-22, 2016, in Newport News, Virginia. Outstanding Second-Year Biology Student was awarded to Samantha L. Kauffman by Professor Jeff Copeland. Professor Dee Weikle recognized three students: senior Alex Bender, for his entry into the Student Research Competition of the Special Interest Group in Computer Science Education; and first-year students Claire J. Waedelich and Carolann G. Wengerd for their poster presentations at Capitol Region Celebration of Women In Computing. Wengerd earned a third-place award at the undergraduate level. 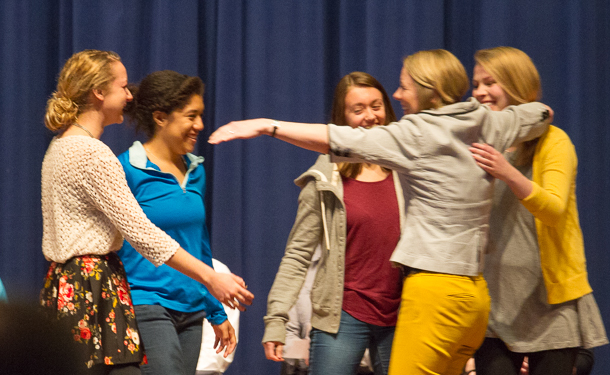 Three chemistry students, all absent on their cross-cultural trip this semester, were recognized. 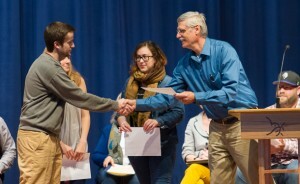 Charles Good was named Outstanding Senior Chemistry Student. Janaya M. Sachs earned an award for excellence in research. 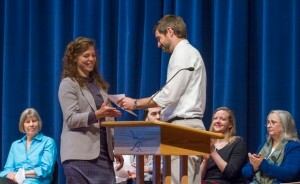 Maria R. Yoder was recognized as Outstanding First-Year Chemistry Student. Jess Rheinheimer was recognized by Professor Ann Schaeffer for academic excellence in nursing program studies. Recently named D-III Scholar-Athlete of the Year, Rheinheimer is a member of the Honors Program and has been inducted into Sigma Theta Tau International Nursing Honors Society. Ann Marie Bauer was awarded the Sacred Covenant Award, which recognizes student-nurses who exemplify EMU’s “sacred covenant” model : service, empathy, agape love, empowerment, and faith. Recognition for servant leadership went to Louise Krall, co-president of the Student Nurses Association. Professor Peter Dula named the winners of the Haverim essay contest as Bekah York and Christian Hershey, sharing first place and a $500 cash prize, and Christian Parks, who won $100, for their scholarly work. Haverim is the alumni group of the department. Professor Justin Poole recognized Clara Bush, MaKayla Baker and Caleb Townsend for their nominations for the Irene Ryan Acting Competition by the Kennedy Center American College Theater Festival. All three are members of the cast of “Distant Witness,” currently in its final run on campus. Oksana Kittrell (from left), Christian Parks, Londen Wheeler, Tae Dews and Philip Watson are recognized for sharing their leadership on the civil rights spring break learning tour and hosting the first Town Hall on Race. Oksana Kittrell, Tae Dews and Christian Parks were the student leaders for the first Civil Rights Learning Tour that traveled over spring break. Christian Parks and Philip Watson planned and implemented the first Town Hall on Race on campus. Londen Wheeler, minister of music, and Christian Parks, choir director, provided leadership to the gospel choir. Brittany Williams, Oksana Kittrell, Kendi Mwongo, Tae Dews and Makora Nyagwegwe led efforts in organizing the first President’s Ball. Delight Tigoe and Lynne Cha led the Alpha Omega Dancers for Christ. Resident director Scott Eyre recognized three-year Community Assistants Carissa Luginbill, Andrew Yoder and Sam Stoner, and also senior returning Community Assistants, Valerie Meza-Cooper and Londen Wheeler. Community assistants live and serve in the residence halls. Director Linda Gnagey presented certificates of thanks to the following student-graduates who provided services in the Academic Success Center: Alex Bender (two years, computer science tutor), Tylar Burgdorf (one year, receptionist), Giulio Garner (two years, Spanish tutor), Stephan Goertzen (one year, computer science tutor), Brielle Hoch (four years receptionist), Andrea King (fpur years receptionist and tutor), Jaclyn Kratz (three years, math tutor), Isaac Mast (one year, computer science tutor), Lauren Sauder (one year, writing and economics tutor), and Andrew Yoder (two years, economics tutor). Emily North, assistant in the Academic Success Center, congratulates senior Stephan Goertzen. Both he and Alex Bender (right) are computer science tutors. Kristy Wertz, a two-year nursing tutor, was recognized as Tutor of the Year. Common Grounds Coffeehouse management team this year was Rachel Schrock, events manager; Abby Dwyer, operations manager; Brianna Kauffman, finance manager; and Valerie Meza-Cooper, catering manager. Timothy Callahan, Juan Luna and Kegan Yoder served on the Recreation Sports Leadership Council, which oversaw the nearly 500 members of the campus community involved in intermural sports. Terry Dotson and Colton Frey were the Game Room Leadership Council, which helped to set the budget and make decisions regarding programs and offerings for the approximately 2,500 visitors who used the game room this year. Lana Miller, undergraduate campus pastor, recognized ministry assistants in the residence halls: Megan Bishop, Perry Blosser, Sarah Boshart, Heyrin (Lynn) Cha, Dylan Grove, Abe Hartzler, Oksana Kittrell, Keyri Lopez-Godoy, Luis Longo, Jasmine Miller, Lydia Musselman, Da’Jahnea Robinson, Austin Sachs and Janet Spain. Jane Ellen Reid introduces LEAD certificate earners. Pastoral assistants, who support the MAs, are Jonathan Augsberger, Amanda Helfrich, Christina Hershey, Jolee Paden, Grayson Mast, Lydia Tissue, Courtney Unruh and Wesley Wilder. The following students completed a leadership seminar series: Brittany Williams, Alex Miller, Abby Dwyer, Meg Green, Hannah Heishman, Rachel Schrock, Grantley Showalter, Olga Balthazar, Delight Tigoe, Malachi Bontrager, Cameron White, Rediet Girma, Gillian Zehr, Ben Zook, Kegan Yoder, Tae Dews, Oksana Kittrell, Richard Robinson, Mario Hernandez, Alejandra Tejada Rivera, Jesse Reist, Jonae Guest, Makora Nyagwegwe and Heyrin Cha. 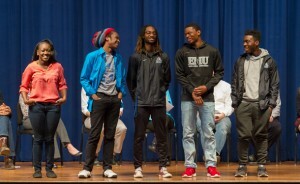 Student Government leaders and athletes in winter and spring sports who had earned honors (see www.emuroyals.com) were also recognized. Editor’s Note: The following Visual and Communication Arts students were recognized in a separate ceremony April 22: Styer Scholarship, Azariah Cox; photography, Jonathan Bush; studio, Brooke Lacock; video, Jonathan Bush and Caleb Schlabach; and motion graphics, Rachel Cardwell.